A wise man once said a bunch of things that are tough to understand. 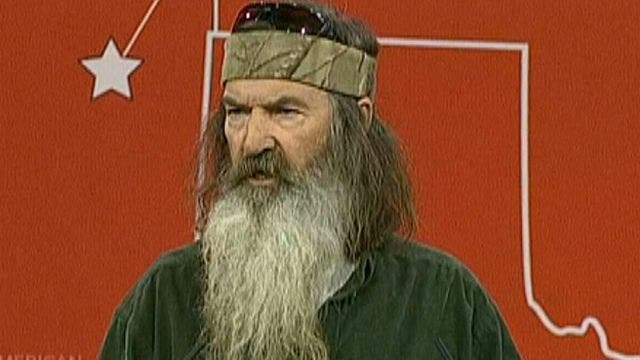 This may come as a bit of a surprise to some, but Phil Robertson—the Duck Dynasty reality television star who came under liberal scrutiny and became a conservative folk hero after being suspended for his, um, colorful views on race relations and homosexuality—said some interesting things at CPAC on Friday. The Conservative Political Action Conference is an annual event that brings together conservatism’s most dedicated grassroots activists, influential thought leaders, and some people who do reality TV. Sometimes people give speeches that make history and launch their political careers, and other times they say things that make you scratch your head. He said these interesting things in an acceptance speech for the Andrew Breitbart Defender of the First Amendment Award. If this has whetted your interest in interesting things said by Phil Robertson, Andrew Breitbart Defender of the First Amendment, Mediaite has video of the whole interesting speech here.